Honor has made a special birthday present to its brand ambassador and actor Allen Ren through its social media channels in China. Ren, whose real name is Ren Jialun, is celebrating his birthday today and could be a household name for Far East series movie fans from the TV drama ” The Glory of Tang Dynasty “. As a birthday present for the Huawei label, Allen received Honor’s first laptop, the Honor Magicbook. Allen Ren thanked the microblogging service Weibo for the notebook present on Honor’s birthday and emphasized that it was a “special honor for him to be a brand ambassador for Honor’s technical products.” A teaser was posted as a “poster” showing the Chinese movie star in front of a stylized Honor MagicBook laptop, as well as a date April 19th. 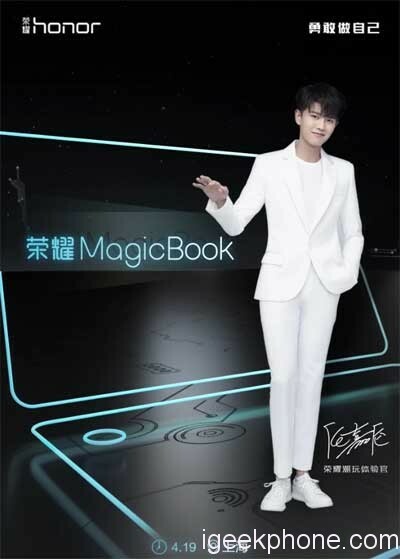 The teaser made the big round in the social networks very fast, whereupon a short time later also a photo appeared, which allegedly is to show the MagicBook notebook already in the live use. If there is something wrong with the leaked photo, then the MagicBook should surprise us with , particularly narrow screen edge. The Honor MagicBook laptop will be bundled with the Honor 10 Smartphone will be presented on April 19 in Shanghai.